Originally published in Capitales, newsletter of the ACT Storytellers Guild in March 2018. My very first ‘costume’ was a simple t-shirt with a bear on it for bear stories (the same t-shirt that I wore the day I met my husband). I then had a perfect excuse to buy a cow onesie for farm stories. I took out my sewing machine and taught myself some basic sewing to create a Very Hungry Caterpillar print skirt. Then I bought a clownfish beanie to go ‘under the sea.’ This dressing up malarkey was addictive. A pair of monkey pyjamas took me into the jungle, I invoked family with a ridiculous Matryoshka doll apron I created with felt. Some weeks my costumes are a simple skirt (pirate print, the characters from Frozen for winter tales, a map of the world for a multicultural theme) while others are more involved. I nearly broke my sewing machine creating a Gruffalo costume, I have to keep switching off my inflatable rainbow butterfly wings when the motor gets too noisy and I look like an absolute doofus in my husband’s beekeeping suit when playing an astronaut. When the dry heat of December rolls around I long for the holidays as I slowly lose the will to live in my Santa suit. This week I popped open the packaging on my latest costume: a Cinderella dress inspired by the 2015 Kenneth Branagh film. It is covered in butterflies and crackles as I move, but it is so PRETTY. I left a trail of glitter at my first booking and my leather car seats now appear to be embossed with the stuff but the kids were pretty excited. ‘YOU’RE A PRINCESS!’ they yelled when they saw me. ‘YOU LOOK FABULOUS!” yelled a staff member. It was a warm day and having three bookings in quick succession meant I had to drive between jobs with my dress on. It was not a comfortable drive in synthetics and scratchy tuille. I desperately needed to pop into SupaExpress for vegies on the way home but I didn’t quite have the guts to pop in with my princess garb on. The school mums might see me! For older children and adult audiences, I'll usually wear a nice dress or something semi-professional, but mostly I try to find a way to make my outfit for the theme. Some weeks I’ll curse that I ever created the expectation of ‘what will Holly be wearing today?’ But mostly I LOVE dressing up. I may be on the wrong side of 35 now, but I’m going to keep dressing up for as long as I can. The looks on the children’s faces and squeals of delight are well worth the fuss. Now to finish crocheting my mermaid tail! You Can Do It Joey, written by Kerry Malone and illustrated by Meaghan Thomson, is the story of Joey, a little kangaroo, who wants to be just like his big cousins who can jump fences with ease. If he’s going to jump like them, he’ll need a lot of determination and plenty of practice. Luckily, Joey has a Mum who is there to encourage him every step (or hop!) of the way. Meaghan Thomson’s illustrations show Joey and his family in gentle water colours. Her style is very much her own, but reminds me of Anita Jeram’s nutbrown hares in Guess How Much I Love You. The scene where Joey looks up at his Mum from inside her pouch makes my heart melt. Canberra author, Kerry Malone, has written a story perfect for children who want to try something new, but feel they are too small, or too scared to do it and for those who need a reminder that someone will always be there to help them along. If Joey can do it so can they! You Can Do It Joey is available in select bookshops in Canberra and Melbourne or from Kerry’s website. There are also some beautiful pictures of Joey to print and colour in. Kerry and Joey also appear regularly at the Old Bus Depot Markets in Canberra. If you are in the nation’s capital, see Kerry’s website for their next appearance! ACT Storyteller's Guild Room in June event. Challenges: Unlike the stories I learn for children, stories for grown-ups tend to be longer and with less repetition. I also find performing for adults to be far scarier than performing for kids! Success: I’ve been practising in the car, in the shower and as I fall asleep at night. With two weeks to go, I’m on track to have my story ready. Goal: Perform in a band concert in front of 700 people. Challenges: This was the first public performance for the band. All the students go to different schools and they only practice together once a week. Miss 11 played her band pieces on the trombone at home. She practised on her own, and with her Dad. Goal: Give a speech at school. Challenges: The speech had to be presented in the school hall without a microphone and everyone from grades 3-6 would be there and some proud parents. Mr 9 practised his speech in the backyard, with the sound of traffic, to make sure he would be loud enough. Mr 7 playing the piano. Challenges: He wouldn’t have his piano teacher, or Mum and Dad there to cheer him on with his class. He picked a new song to play, but played it over and over again at home. What did our challenges have in common? Like Joey in the story, we found that practising over and over again helped us to feel confident and helped us to get better at our goals. We’re going to try our best to remember this experience for next time we face a hurdle and think everything is too tricky, and remember that we can do it! What goals and challenges would you like to set for yourself? Is someone in your house learning to tie their shoes or tell the time? You Can Do It Joey was written by Kerry Malone and illustrated by Meaghan Thomson. I love a good mystery; I love to read and watch them and have been waiting to share them with Miss 11. When her friend bought her a Murder Most Unladylike book for her birthday last year, I was thrilled to see that someone had written a murder mystery for kids that she could read before moving on to the classics. That someone is Robin Stevens, who has now published five books in the Murder Most Unladylike series and Miss 11 and I are hooked. The series chronicles the adventures of Hazel Wong and Daisy Wells as they solve murders that just seem to keep happening wherever they find themselves. Hazel has travelled to England from Hong Kong to attend Deepdean School for Girls, and with her new friend, Daisy Wells, they form a secret detective society. The Murder Most Unladylike series lets readers visit the world of English boarding schools in the 1930s through Hazel’s eyes with its clothing, food and customs, yet they also deal with the age old problems of teenage girls: friendship quarrels, grumpy teachers and gossip. Hazel struggles to adjust to her new life at first but is a bright, empathetic and relatable hero who has a healthy amount of fear when faced with dead bodies and murderers. Daisy, on the other hand, is full of charm and bravado. She is far keener to drop everything and dive in when mysteries present themselves. Robin Stevens’ stories are full of humour, fun and mystery, with plenty of food to drool over when the girls’ stop work for bun break (morning tea). The regular characters feel like friends and the new characters in each book are intriguing and memorable. I love that Robin Stevens has added much needed diversity to a genre that in the past has been homogeneous, and where the rare diverse characters were often the villains. The mysteries Hazel and Daisy solve are always intriguing and keep Miss 11 and me guessing until the very end. There is just enough peril to keep us on the edge of our seats, without being too frightening for the target audience. Mr 9 has nearly finished the first Murder Most Unladylike mystery and is full of theories. He loves it. The only downside is now there’ll be three of us fighting over who gets to read the next book first! While the first five novels in the series each contain a murder that is solved over the course of the story, Cream Buns and Crime is a delightful tuck box of goodies. We find out what happened when Hazel and Daisy solved their first mystery – The Case of Lavinia’s Missing Tie, as well as several other mini mysteries. Cream Buns and Crimes also contains tips from Daisy on detection as well as her favourite fictional detectives. Sherlock Holmes, Miss Marple and Poirot rate a mention including some I’d never read before, such as Inspector Alan Grant and Lord Peter Whimsy. But perhaps one of the best parts of the latest book is the recipes for treats eaten by Hazel and Daisy during their many bun breaks, such as squashed fly biscuits, fudge and moon cakes. Miss 11 and I thoroughly enjoyed Cream Buns and Crime and we’re eagerly awaiting Robin Steven’s next Wells and Wong mystery. Cream Buns and Crime was written by Robin Stevens and published by Penguin. We just had to try out one of the recipes from Cream Buns and Crime. While I was intrigued by Squashed Fly Biscuits, Miss 11 and I were very keen on having a go at making jam tarts. We were catching up with friends for afternoon tea, so it was the perfect opportunity to try out the recipe. I love baking but am no good at pastry. Fortunately the recipe in the book was easy to follow. 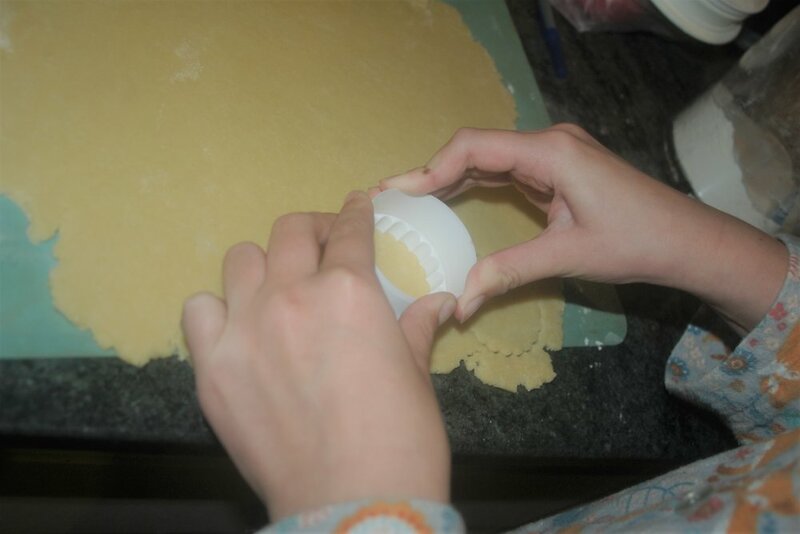 Miss 11 had fun getting her hands into the dough, cutting out the pastry rounds and dolloping raspberry jam onto them. I cut out tiny flowers to stick on the top to use up the leftover pastry. The result was a pile of tiny tarts that were fun to make and nearly all devoured within minutes of serving them. Deepdean School for Girls might be a murderous place to go to school, but golly, those girls eat well! What recipe would you like to taste from a favourite book? That surname is familiar, isn’t it? I wonder if she’s related to…she is?? Yes! Kate Pankhurst is a distant relation of suffragette Emmaline Pankhurst, who appears in this collection of stories of women who made history. The book’s design and fun, vibrant illustrations are a delight. Double page spreads are devoted to thirteen women and we learn about their backgrounds, their inspiration and their achievements. Many of the great women you may already know well, such as Marie Curie, Anne Frank and Amelia Earhart, but the book presents lesser known figures from history such as Mary Seacole and the charmingly nicknamed Agent Fifi, a British spy during World War 2. Readers will be sure to learn something new from this book. For instance, did you know that Marie Curie liked to sleep with a glowing jar of radium beside her bed? Or that Mary Anning was one of the world’s first palaeontologists and discovered the first known skeleton of an ichthyosaur? The thirteen women in the book are diverse in both their backgrounds and their achievements are in a wide range of fields such as science, civil rights, literature, art, fashion, business and sport. Young readers are sure to find a Fantastically Great Woman that speaks to them. Miss 11 had already read several biographies of Amelia Earhart, but after reading Fantastically Great Women Who Changed the World, will be seeking out more detailed biographies of some of the other inspiring women next! Fantastically Great Women Who Changed The World was written and illustrated by Kate Pankhurst and published by Bloomsbury. The Who Was series (by a range of authors) includes biographies of Amelia Earhart, Rosa Parks and Sacagawea and are published by Penguin Random House. Our school held Dress as ‘Someone You’d Admire Day’ recently, a dress up day and chance to raise funds for the Canberra Hospital Neonatal Intensive Care Unit. Mr 7 dressed as Matt Kelly (a member of the kids’ comedy duo The Listies), Mr 9 dress as his favourite illustrator, Aaron Blabey and Miss 11 was suffragette Emmaline Pankhurst (having been inspired by the book). The boys’ costumes wore regular clothes but for Miss 11 we made a sash in the suffragette colours of green, purple and white, and put it together with a hat, skirt and blouse. She certainly stood out amongst the You-Tube stars, Batmen and footballers! Who is your hero and how would you dress as them? Mr 9 devoured the first three The Mapmaker Chronicles books recently and was thoroughly unimpressed when I told him he had to wait a month until the release of the fourth. When Beyond the Edge of the Map arrived he was one happy bookworm. While Mr 9 is a great fan of the series, I hadn’t dipped my toe into the world of Verdania yet, but picked up the story and found myself immediately drawn into a new world. Beyond the Edge of the Map continues the story of Quinn, who in the previous books, trained as a mapmaker and took to the sea to create the first map of the world for King Orel. Quinn is now enjoying a quieter life working on the family farm when the King’s enemies come looking for him. For his own safety, and that of his family, Quinn has no choice but to set sail again. Quinn and his crew fend off animal attacks, unscrupulous enemies and nature in all its fury. He is forced to take up responsibilities beyond his years and with every hardship overcome, new troubles present themselves. Beyond the Edge of the Map is always a fun, swashbuckling adventure even when Quinn’s chances of survival seem grim. A.L. Tait creates characters that are relevant to modern readers without compromising the authenticity of Quinn’s time and place. Quinn is also a hero children can relate to, struggling with fear and self-doubt and, at times, a longing for home. We feel Quinn’s joy when he greets a friend and his fear when faced with an old foe. I particularly enjoyed Quinn’s crew who provided comic relief and good natured banter at just the right moments as they complement Quinn strengths with their own skills. Mr 9’s favourite character is definitely Quinn and he has decided to dress as Quinn for Book Week in August. A.L. Tait has some excellent costume tips on her website for kids wanting to do the same, so we’ll be taking our cues from there. Mr 9 and I really enjoyed reading Beyond the Edge of the Map, and while Mr 9 is hoping Quinn will have a fifth adventure, I’m looking forward to introducing the books to Mr 7 soon. The official The Mapmaker Chronicles website has some great links to extension activities including crafts, book recommendations and further reading about cartography. As a children’s storyteller in my day job, I was preparing pirate stories this week, so dug out the map I made last year to use as a treasure map prop. It worked well to set the scene for the story and the children responded well to it. With that in mind, and after reading Beyond the Edge of the Map, Mr 9 and I felt making our own maps was the perfect post book activity. We decided on a family walk on a sunny Canberra afternoon, to map a section of Lake Burley Griffin. Mr 9 and Miss 11 were armed with clipboards, paper and pencils to draw significant landmarks and chart a course which was at times challenging and full of peril. The life of a mapmaker is fraught with danger as we dodged cyclists, Segways, fishermen and runners and the most terrifying creatures of all, dogs. We passed the tunnel playground but decided not to stop, as it was swarming with frightening creatures (teenagers) and continued on, stopping to admire the view and sketch landmarks. We saw plaques honouring Australians of the Year, the Captain Cook Memorial Jet and the statue of Robert Menzies. We also noticed how many Canberra landmarks were beyond the edges of our maps, such as the National Museum, the Australian War Memorial and Parliament House. The kids squished some of these onto their pages, while others remained in the distance, perhaps to be mapped another day on another walk. The weather was nearly thirty degrees so we stopped for rations at a safe port (ice creams at a coffee van) then continued on into the sunset. We finished our activity where we started, more tired and sweaty than when we began but with a sense of satisfaction. The siren call of the cool shower whispered across the water. When was your last adventure into the unknown and how did you capture the moment? The Mapmaker Chronicles – Beyond the Edge of the Map was written by A.L. Tait and published by Hachette Australia.